TRAVEL IN STYLE IN THEIR THUNDERHAWK DROP SHIP! 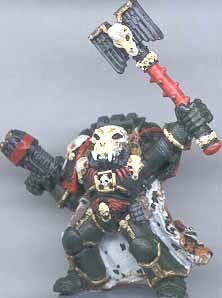 My Dark Angels were done around 40K 2nd Edition, so many of them are conversions of, ironically enough, Space Wolf models (the nicest models available at the time). 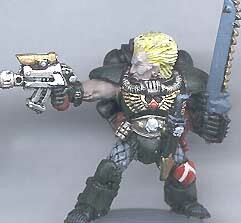 This is an old Space Wolf scout sergeant with a haircut and a Dark Angels paint job. Gold, red and white are fair trim colors for Dark Angels. 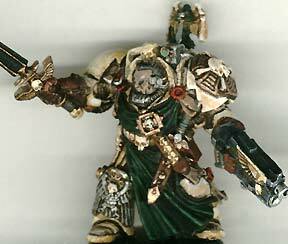 Another example of looting the Space Wolves for models- a barely converted Ulrik the Slayer in Dark Angels colors. Now that plenty of other nice chaplains are out, I've been tempted to repaint this model for my Space Wolves, but I just like the way the paint came out on this guy too much to repaint it. My favorite element is the Leopard skin cloak. The inside of the cloak is painted white with little black splotches on it. A back shot of the cloak. I start with a light brown-orange color, then put some black splotches down with unusual shapes on them, then use a rusty reddish brown to put a small splotch inside the black splotches. You can then drybrush for highlights if you want. 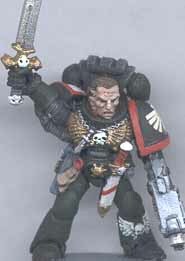 The Dark Angels have no less than three color schemes (the greedy bastards)- Dark Green, Black (Ravenwing) and White (Deathwing). 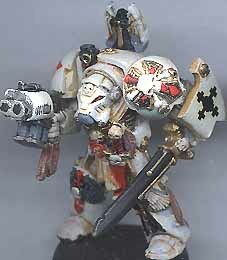 I do like the look of a white terminator though. This sergeant has a back banner top added to his back, but is otherwise stock. I primed the model in white, used a brown wash for shading, and painted other details black, red, or gold for contrast. 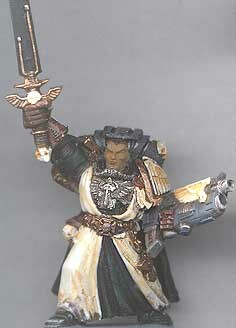 My favorite "old" Marine model has to be the old Terminator Captain. 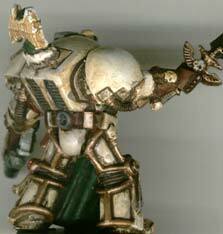 Even though my Deathwing Terminators were new style, I went ahead and painted this classic model in deathwing colors. When washed with dark brown, gold is actually a nice color for parts like the grenade launcher.Black and red stripes on the leg and power glove add even more contrast detail to an already nicely detailed model. 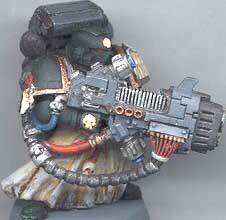 The new Devastator models are awesome, as are the new Dark Angels veterans. So I combined the two! I added the new Heavy Plasma Gun, arms and pack to a Veteran torso, complete with metal shoulder pad. Aside from the Purity seal on his shoulder, this is an all-metal conversion! The picture below is a front view of this model. 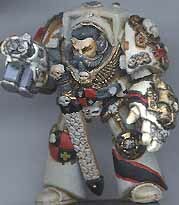 This is the first time I felt like I had made a Space Marine model that captured the feel of John Blanche's paintings. Menacing, gritty, and unique- not just a "stamp-em-out" clone of every other marine. 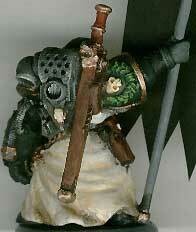 I painted the armor dark green and the robes white with a brown wash. The plasma gun is dark grey, with dark brown, steel, red, and blue. The shoulder trim is brass with a dark brown wash to tone it down..
Another all metal veteran conversion, this time starting with a metal Plasma Gun Biker upper torso attached to a veteran lower torso. 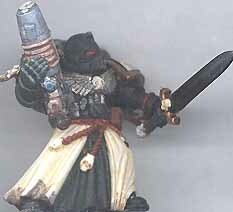 The sword arm is from the Master of the Ravenwing. The under robe is painted black for contrast, the outer robe white with brown wash. 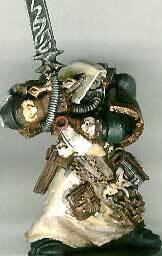 Otherwise this is my standard color scheme for Dark Angels. 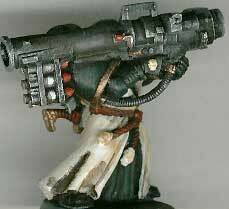 Another shot of the plasma gunner. You can see the purity seal added to the shoulder. The grips on the plasma gun were painted leather and drybrushed tan for that classic "wooden" look. The "Dirt" along the bottom of the robes was done with a dark brown wash- much more realistic looking than perfectly clean marines. 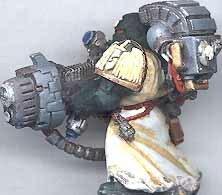 My veteran Missile Launcher model is a standard veteran body and shoulder pad, with a special missile launcher added on similar to the one I made for the Iron Hands. (See how I made it HERE). The dagger is from the plastic Berzerker sprue. 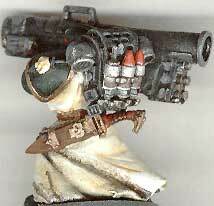 Even while bearing heavy weapons, the veteran models still have a classy yet formidable look to them. A better view of the missile launcher. I was having so much fun doing conversions with the veteran models, I decided to make my own standard bearer rather than use the Bethor model. First off, I wanted him to have a power glove, so I used one from the new Space Wolf accessory sprue, with a veteran pad added over it. I like to give my standard bearers power gloves- helps 'em keep a grip on that standard! The sword on the back is from an old High Elf Chariot model- I just liked the way it looked on the back (a bit hard to use a 2 handed sword with a power glove). The standard (and the arm holding it) are from a completely seperate standard bearer model (the one that comes in the command squad, I believe). To make the laurels stand out from the dark green armor, I highlighted the green with yellow. This model is so damn nice, I just couldn't bring myself to do any conversions at all. I painted Ezekiel with the same colors as all my veterans. The robes are surprisingly dirty for a character- but there's no doubt he's been in the field that way. Rather than go for a garish color on the force sword, I painted it black and just drybrushed it steel. Quick, easy, and effective. I'm very happy with the paint on this model. I primed it white, but instead of just doing a light brown wash in the cracks, I did a wash over the whole armor, then went back with a wet brush and "washed away" areas to lighten them. This works great with enamels since the white primer is tough and won't dissolve. 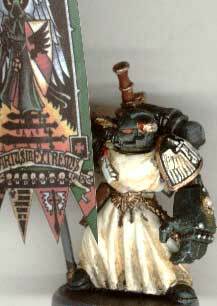 The robe was painted black and "wetbrushed" dark green (drybrushing was too hard to control and lifted the black paint off the white primer). I used a dark brown wash in the cracks and to shade the gold details.